Issue: Jackson Parker Communications was hired to help define and brand the new healthcare organization. 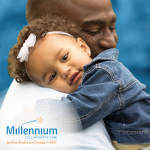 Millennium Collaborative Care is a new organization that includes a collaborative of healthcare providers, physicians and community organizations across 8 counties that are actively engaged in transforming the delivery of healthcare to the Medicaid community. The work is ongoing. The organization had to quickly identify and begin work on a number of projects under New York State’s directives. Therefore, there was little time to effectively develop the brand and define who they were. Jackson Parker’s Tasks included: Developing the Brand and key messaging, coordinating the development of a new logo and tagline, developing an integrated marketing plan and promotional items (brochures, identity suite – business card and stationary), new website, video, a communications guide and style guide. In addition, articles were written for local publications and a commercial script written for the Executive Director. I. Open House Planning, Coordination, and Management– Drafted event plan to introduce the organization and their new location. The process included the development of a concept for the invitation and provided content and design coordination with assigned design team. Coordinated logistics, promotional signage, and décor setting. Attended event to coordinate photography and discuss the brand story. II. Video Development – Video was essential to defining Millennium Collaborative Care and their impact on reforming the delivery of medical care to Medicaid patients. JPC assigned a video team, coordinated project which included writing script and providing edits, hiring a makeup artist for the video shoot and assisted with production and final edits. III. Development of Signature Brochure and Millennium Presentation Folder: Hired design team, worked closely with design team by writing content, providing copy editing, layout suggestions (selection of photos and placement of content), and coordinated printing process. IV. Website Development– Client website and email template needed a redesign and visuals that better reflected the mission of the organization. Assigned designer and developer and worked closely to coordinate the project which included, providing the copy, edits, and photo selection input.